Map of Southern Savage Divide Region of Appalachia, West Virginia for Fallout 76 Video Game. 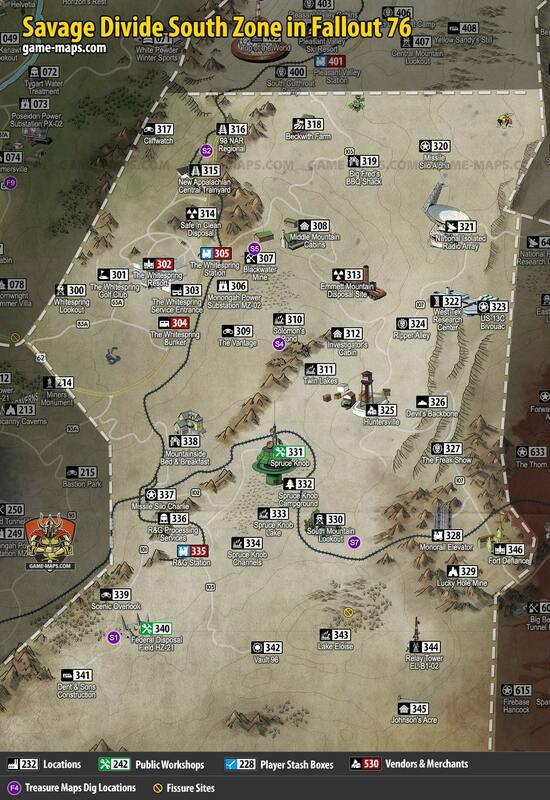 The map contains all the locations you can visit in F76, Public Workshops, Player Stash Boxes, Vendors, Merchants and Traders locations, Treasure Maps Dig locations and Fissure Sites. The difficult mountainous terrain is the place where you will find pre-war government installations. The Southern Savage Divide zone is for players in the level range 15 - 25, monster are level range 15 - 100. Map of Savage Divide South Region for Fallout 76 Video Game.